Barbecue is big in the U.S. Every region has its own style and flavor and New Mexico is no different. Many of the state’s barbecue joints take the best of Central Texas or Memphis or Kansas City style and kick it up a notch with New Mexican flare. Here are 10 of the best. Real wood. Real smoke. Real BBQ. That’s what the sign out front says and when you step inside the aroma supports those declarations. It’s next door to the Tu-cumcari Ranch and Supply store and fits right in to that western motif with its community seating picnic tables, old vintage road signs and cowboy hatted stuffed bear. And then there’s the meat—brisket, pulled pork, sausage and ribs served in sandwiches or as plates with sides. All of the meat is tender, portions are good-sized and sides come in three sizes. Bread is baked daily. Fresh doughnuts in the morning if you’re coming through town early. This old-fashioned real pit barbecue roadhouse serves up solid plates of Southern and Texas-style barbecue beef brisket, pulled pork and sausage with just the right amount of smoky flavor. All meats are slow-cooked over hardwood for a sweet taste. You’ll find a nice pink smoke ring on the brisket and a great bark on the outside. The pulled pork is imbued with flavor from a dry rub. The meats are juicy and tender without the honey barbecue sauce, but add a dollop for an explosion of flavor. If you’ve never tried fried okra, this is the place to give it a go. Central Texas barbecue is all about the rub, a secret blend of spices that defines a pitmaster. Mad Jack’s is a perfect mix of savory and sweet. All meats are cooked over pecan or oak wood which adds to the layers of flavor found in the brisket, pork ribs, chicken, pulled pork and sausage. If you’re lucky, you’ll stop by on a day when the massive dino beef rib, large smoked turkey legs and roasted corn are coming off the grill. Sides are made daily: fresh potato salad and coleslaw, slow-cooked pinto beans and a really cheesy mac and cheese. Food is served on waxed paper, no plates which adds to the comfortable atmosphere. Roll down your windows when you pull up here and you’ll get a whiff of what you’re in for. Succulent brisket, smoked roast turkey, tender ribs and juicy pulled pork and sausage are cooked over a fire of hand-selected and hand-harvested apple wood. The spicy barbecue sauce has a kick, but if you’re looking for heat so do the green chile mashed potatoes, baked beans and the green chile shredded brisket meal. A piece of homemade cobbler, pie or cake might have to go home in a takeout box after this hearty meal. The owners of this local landmark began selling smoked sausage kielbasas on-a-stick at their well-established produce market. What began as an add-on to their business turned into their business. Now they smoke everything from chicken to pork to beef ribs to tri tip and, of course, a variety of sausages and serve what they’ve dubbed mountain-style barbecue. They use a special rub … it’s a secret, and keep meats in the smoker for up to 13 hours. Everything is served cafeteria style so you get to pick and choose your favorite meats and sides. For more than 10 years, the cafe has been serving customers the perfect marriage of heat and meat. The founders are award-winning pit masters. They use tried-and-true rubs and sauces they’ve perfect throughout their years of smoking meats over toasty pecan wood. You can literally go whole hog here with the ultimate hot platter of pulled pork, beef brisket, pulled chicken and baby back ribs, plus beans, coleslaw, potato salad and dinner rolls. Specialty of the house, other than just the smoked meats, is barbecue nachos with a choice of pork, brisket or chicken. All meats are sold by the pound, too. Great for a take-home meal. Slow-burning oak gives the meats here a heavy smoke flavor, making Rudy’s fare distinctively different. In addition, they add a dry rub that adds a wide-range of spicy overtones. Yes, it’s a chain, but the barbecue tastes just like its Texas Hill Country roots. All the standards are here: brisket, turkey breast, pulled pork, baby back ribs and a taste of the southwest, jalapeño sausage. Walk-up ordering, funky red food trays and red-checked tablecloths create a casual, laid-back atmosphere. Smoked meats aren’t the only food on the menu here, but they’re the best and they’re used in everything from the pulled pork street tacos to the brisket sandwich to the smoked chicken nachos. 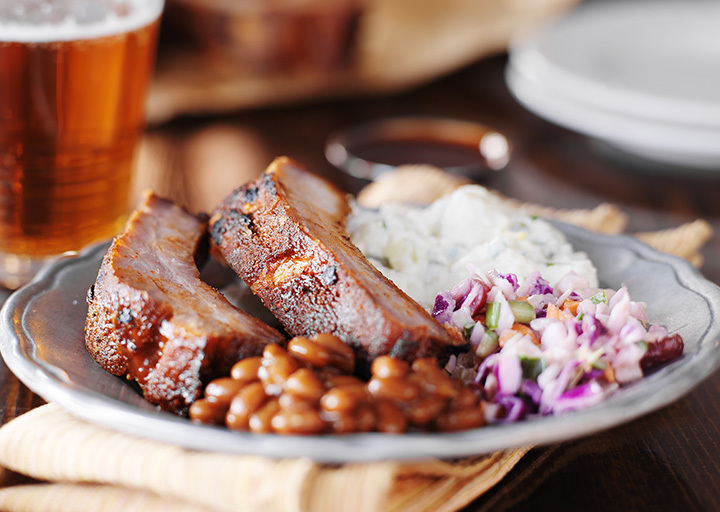 Try one of the BBQ Plates served with Smokey’s sauce, half or full rack of ribs or the “Smokey” sausage with some sides. It’s food enough for two … meals or people. Get the homemade potato chips as a side. More than 40 beers on tap. Country western music in the background. Great casual dining. When the restaurant has rib in the name and there’s a roll of paper towels on the table you’re in for a finger-lickin’ good meal. For more than 25 years, this has been the local place for home-style barbecue. They serve hickory smoked brisket, chicken, sausage, pulled pork and first-rate pork ribs. Sides are customary for a barbecue spot: corn on the cob, black-eyed peas and okra top the list of favorites. Save room for homemade fruit cobbler. No, this isn’t a show in New York, but the food does deserve a round of applause. The barbecue is traditional sliced brisket, pulled pork, turkey, baby back ribs and polish sausage. Combination plates with two or three choices are super-sized and served with a thick slice of Texas toast. Weekly specials highlight both barbecue and local favorites like blue corn enchiladas and chile cheese fries, meals in themselves. Word on the street is that the chile cheeseburger gives the barbecue a run for its money.